THE MUSICIf you are looking for something different in Christmas music — if our Christmas office parties or gatherings at home have been too much the same for the past few years, and you would like to introduce a refreshing new note into the proceedings—let pianists Ferrante & Teicher take you on an ADVENTURE IN CAROLS. The paths along which this talented team will lead you bear the old names with which you are familiar — White Christmas, Jingle Bells, Santa Claus is Coming to Town, and others just as popular — but the names, plus the famous melodies, are the only things about this recording which bear any resemblance to any other version of these carols you may have heard. For this recoding Ferrante 7 Teicher arranged the carols for two pianos—or should we say that they arranged two pianos for the carols? Actually, they did both—for, if playing conventional pianos in the conventional manner did not produce the effect the boys were after, they worked on both music and pianos until they got just what they wanted. Westminster’s studios never had seen anything like the session that produced this unique recording. All over the country, of course, audiences for years have seen Arthur Ferrante or Louise Teicher rise from his bench in the middle of a performance and address himself to the innards of his Steinway—alternately muting, plucking, strumming and beating the strings. Nor does either of them hesitate to use his elbows, forearms or knuckles to elicit a desired chordal effect—not to mention an assortment of wooden and metal gadgets designed to give the pianos a new personality altogether. These unorthodox and sometimes gymnastic doings are not calculated to amuse. They are an integral part of the team’s very special arrangements. Their goal always is to achieve the maximum tonal contrasts and to simulate orchestral color as vividly as possible within the limitations of pianistic dynamics. But no concert audience ever say what Westminster’s engineers saw — or ever heard what has been captured on this recording. It’s not a single recording, to start with, but a double one—no pun intended. The boys played everything through once, then donned earphones and went over the same ground again, interpolating all manner of fancy figurations and fugal folderol. What with a profusion of microphones stationed over the keyboard, the gadget-laden strings and the paired celestas, the results herewith are unlike any pianism, duo or otherwise, that you have ever experienced. It is as if Santa had, at last, discovered high fidelity. After so many years of hearing the same old tunes played the same old way, Old Nick undoubtedly would join everybody else in welcoming these new Christmas sounds. 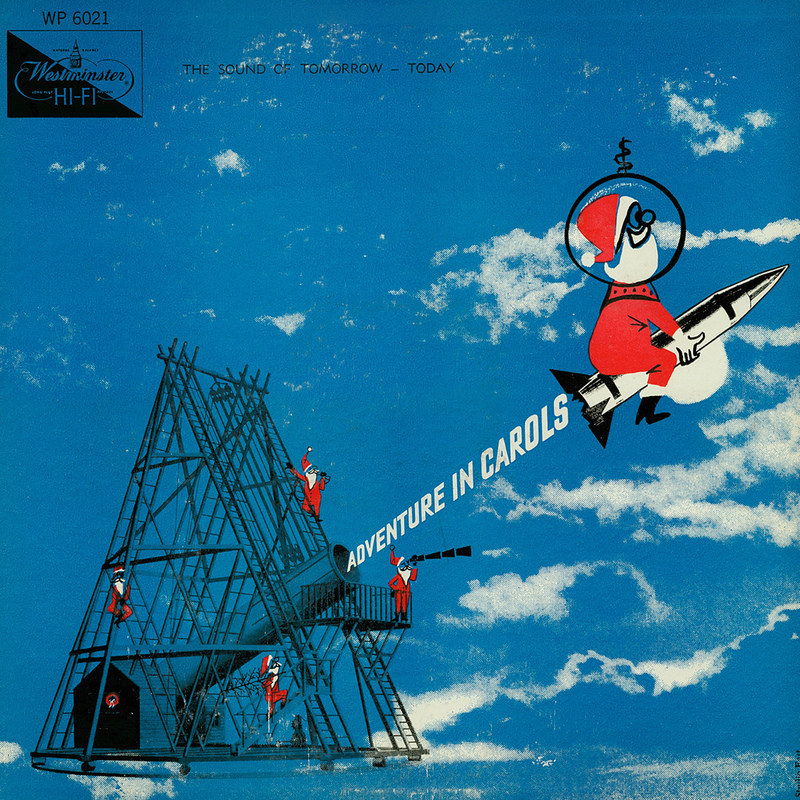 Westminster also released a 10" Lp titled Xmas Hi-Fivories (WL-3044) containing eight songs from Adventures In Carols.